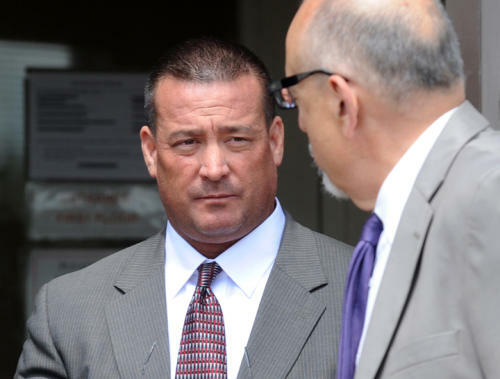 SAN FRANCISCO — A federal prosecutor told jurors Monday that former Danville police Officer Stephen Tanabe set up men for drunken driving arrests on three occasions in exchange of 3.5 grams of cocaine and an expensive Glock pistol. “To put it more bluntly, he sold his badge,” Assistant U.S. Attorney Philip Kearney said in his opening statement at the trial for the four-year Contra Costa County sheriff’s deputy, ¿who was arrested in the wake of a 2011 police corruption scandal centered around former Concord private investigator Christopher Butler and ex-Contra Costa Narcotics Enforcement Team commander Norman Wielsch. Both are serving time in federal prison. Tanabe, who befriended Butler when they both served on the Antioch police force in the mid-1990s, knowingly participated in the scam three times in late 2010 and early 2011, Kearney said. It is true Tanabe had an active role in those three arrests, said defense attorney Tim Pori, but at no point did Tanabe take a bribe — drugs, guns or otherwise. Pori painted Tanabe as a family man and hardworking officer for Danville, where police services are provided by the sheriff’s office under contract and DUI arrests are a late-night patrol officer’s bread and butter. The Danville police force gives its officers “performance objectives” in which they are rewarded for DUI arrests, Pori said, and Tanabe had a duty to make such arrests himself or to alert his fellow officers to drunks on the road when he himself was off duty. The government has more than 25 people on its witness list, including Butler and his former employees integral to the setups, whom Pori told jurors cannot be trusted. He listed the witnesses’ past transgressions, some illegal, others unethical. Tanabe, Pori said, was thrown under the bus by Butler, “a master manipulator” who was caught on video selling stolen drug evidence. Butler needed to name names to the government to shave years off the stiff sentences he was facing. “The government’s case is going to fall on its face when you hear the cross-examination of these witnesses,” Pori said. The U.S. attorney’s office¿ tried to convict Butler for the dirty DUIs as well, but the charge didn’t stick because Butler, unlike Tanabe, wasn’t a sworn officer when they were carried out. The first prosecution witness takes the stand Tuesday. COPS LIE, IT’S A FACT! We try to provide you information as a means of education, power and as way to better prepare and protect yourself from dirty cops. Here is an example of dirty cops showing that the law does have problems because if this was a patch member that just told a cop he has a loaded firearm in his car or on his bike who was just in shooting someone just or not, that patch member would be on the ground at gun point. Read it for yourself amke your own decision. Two weeks after a Florida jury found George Zimmerman not guilty of second-degree murder and manslaughter in the Fenruary 2012 shooting death of Trayvon Martin, Zimmerman was in Forney, being pulled over by police there. According to inForney.com, Zimmerman was stopped Sunday heading west on US Highway 80 just past FM 548. TMZ is reporting that when he was pulled over, Zimmerman told officers he had a gun in his glove compartment. When contacted by The Dallas Morning News, Forney police would not immediately confirm; they asked instead for a public-records request concerning the incident. They eventually sent a report that shows he received a verbal warning. 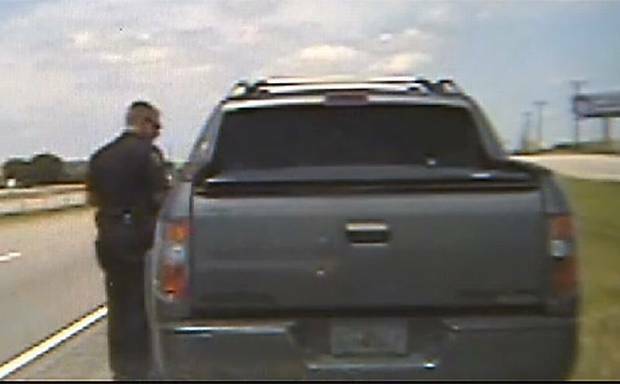 The document, which contains Zimmerman’s birthdate, says the Floriday resident was pulled over at 12:47 p.m. Sunday in a gray 2008 Honda; it doesn’t say how fast he was traveling. inForney.com and TMZ feature different screengrabs from a dashcam video said to stem from the traffic stop. The truck in question appears to have Florida plates, confirmed by the police report. “You didn’t see my name?” said Zimmerman. See here is where the issues lie, cops do illegal searches and seizures everyday, no can catch them doing because because they use their power to hide, lie, destroy evidence of their wrong doings. During this video we need for the media to come out from behind there certain which they are hiding behind and catch them and then play it on the news like they do with everyone else. I don’t trust cops one bit because they are just like everyone else. There is good and bad in every company or organization out there. The reason we don’t catch more cops is because they do this right here. This video clearly shows they violate people’s rights, lie about it, hide off camera, and cover it up. All while wearing their badges and uniforms. Protect yourself how ever you can from Police who feel it is ok to violate people’s rights. A state police report on a Prescott saloon fight involving biker police officers says violence erupted when a Phoenix officer started throwing punches at another bar patron who asked about his motorcycle club’s patches. Arizona Department of Public Safety detectives investigated the Dec. 22 fracas at the request of Prescott police because high-ranking members of several Yavapai County law-enforcement agencies also belong to the Iron Brotherhood motorcycle club and were involved in the brawl. About 16 members of the law-enforcement club were celebrating the holidays on Whiskey Row when fighting broke out at Moctezuma’s Bar. According to the DPS report, 23-year-old Justin Stafford was questioning Iron Brotherhood president Billy Fessler, who was Prescott Valley police chief at the time, about patches on his vest. Suddenly, the report says, Phoenix police Officer Eric “Guido” Amato stepped in, grabbed Stafford by the throat and punched him several times, apparently breaking his nose. The report says numerous witnesses, supported by video evidence, place blame for the outburst on Amato. Amato, the club’s sergeant at arms: assault and disorderly conduct. A Phoenix police spokesman confirmed that his department also has an internal investigation under way, but he would not comment further. Fessler, who has since resigned as police chief: obstructing a criminal investigation and false reporting. William “Bill” Suttle III, club vice president who resigned from his job as a Yavapai County sheriff’s sergeant: obstructing and false reporting. Greg Kaufman, a paramedic supervisor with Ajo Ambulance Services: assault and disorderly conduct. A separate administrative review conducted by a Coconino County sheriff’s commander and released Thursday by the Yavapai County Sheriff’s Office concluded that at least two Yavapai County sheriff’s deputies — Suttle and Capt. Marc Schmidt — hindered investigators by lying and withholding information. None of the Iron Brotherhood members could be reached for comment. DPS detectives referred their report to the Maricopa County Attorney’s Office, where spokesman Jerry Cobb said the information is under review. No one has been charged since the incident. The Iron Brotherhood claims on its website to be a fraternity of motorcycle-riding law officers who do not associate with criminals. The DPS report notes that numerous members of the club made statements that were contradicted by videotape, other evidence and civilian witnesses. The report said Kaufman acknowledged taking part in the altercation and possessing a knife. During the criminal probe, records show, some Prescott-area officers in the club sought to portray Stafford as a Hells Angels associate out to discredit the Iron Brotherhood, but there was no evidence behind the claims. Besides criminal charges and administrative actions by employers, those involved could face sanctions from the Arizona Peace Officer Standards and Training Board. The regulatory agency is empowered to suspend or decertify officers for misconduct ranging from criminal offenses to lying or malfeasance. But the bar fights aren’t supposed to involve a biker gang made up of police officers carrying brass knuckles and knives. The fallout from such a brawl in December has led to the retirements of a police chief and two senior sheriff’s officials and recommendations of felony charges against the former chief for his alleged role in trying to cover it up. Two other current or former law enforcement officers and an ambulance supervisor face possible charges, and local and state agencies are investigating involved officers. At least one federal officer who also is an Iron Brotherhood Motorcycle Club was at the bar, and a Customs and Border Protection spokesman said the agency was looking into his role in the group. The motorcycle club had many of the same rituals and garb as “outlaw” gangs, according to interviews and police reports. They used nicknames only, wore biker club patches and rewarded at least one member who got in a previous fight with a special patch. Just how a group of mainly high-ranking law enforcement officers decided to join what looks and acts in many ways like an outlaw biker gang baffles the local sheriff. Police said no weapons were used but were displayed before the bar fight. As is often the case, it wasn’t the crime, but the clumsy efforts to cover it up appear to have blown the lid off the Iron Brotherhood’s Arizona chapter and its police officer members. If the officers in the club had just called police themselves and been straightforward, the matter would have been relatively minor, Mascher said. The motorcycle club, whose members used nicknames like Top Gun, Guido and Mongo, had been holding its Christmas party at a bar where the booze was flowing freely, according to Arizona Department of Public Safety reports released Thursday. A group of club members decided to go to another bar, and while there an intoxicated man came up and began asking the club president about the patches on his vest. Another member pushed the man away, and punches were thrown, leaving the man with a smashed and bloody nose. The president was Prescott Valley Police Chief Bill Fessler, who left his job shortly after the brawl became public. Also retiring were Yavapai County Sheriff’s Sgt. Bill Suttle and Capt. Marc Schmidt. A sheriff’s internal investigation shows both apparently obstructed police investigating the fight. Phoenix police officer Eric Amato and Greg Kaufmann, a supervisor at an Ajo ambulance service, are accused of assault and disorderly conduct. The report also recommended a charge of disorderly conduct against one of the alleged victims, Justin Stafford. Phoenix police are investigating the man who allegedly threw the punch, Amato, but he remains on active duty. “We expect our officers to act appropriately, and that’s what we’re looking at,” Phoenix police spokesman Sgt. Tommy Thompson said. The Maricopa County attorney’s office is reviewing the report and would file charges, if warranted, spokesman Jerry Cobb said Friday. One member of the group who has since resigned, Prescott deputy police chief Andy Reinhardt, said Friday that the clothing the members wore should not be used against them. Reinhardt said he wasn’t in the bar when the brawl broke out, and said if crimes were committed, people should be held accountable. “I have rode with the group in the past, and there’s never been this type of an issue whenever I rode with them,” he said. Missouri claiming the traffic stops in Ellisville amounted to a violation of their First Amendment right to free speech. 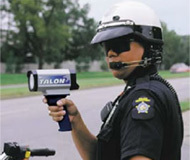 On November 17, 2012, Elli noticed a speed trap on Kiefer Creek Road around 2:50pm. He flashed his lights at oncoming traffic to ensure they would adjust their speeds to avoid receving a citation. The American Civil Liberties Union of Eastern Missouri’s legal director, Anthony E. Rothert, is arguing the on Elli’s behalf that this represents expressive conduct that is protected by the Constitution. “The flashing of headlamps is commonly understood as conveying the message to slow down and proceed with caution,” Rothert explained. Though Elli was not speeding or violating any other traffic law, he was pulled over by an unidentified police officer and handed a traffic ticket claiming a violation of a city ordinance mentioning the flashing warning signals installed on school buses. “No reasonable officer would believe that plaintiff had violated Section 375.100,” Rothert argued. Elli was threatened with a $1000 fine, but he insisted on taking the matter to trial. Charges were dismissed on February 12. The Hells Angels Motorcycle Club has filed a lawsuit against several federal agency heads — including Homeland Security Janet Napolitano and Secretary of State Hillary Clinton — claiming the group’s foreign members have been wrongfully banned from entering the United States. The lawsuit recognizes that Homeland Security and the Department of State made an agreement to define the Hells Angels as a “known criminal organization” in the Department of State’s Foreign Affairs Manual — thus making them ineligible to obtain a visa. Well, they are a “street gang” in Maricopa County — at least, according to disbarred and disgraced ex-County Attorney Andrew Thomas.